Stretching about 150 miles from north to south, and roughly 75 miles from east to west, Palestine is a land of contrast and conflict. Rugged mountains contrast with flat, fertile valleys. The peak of Mt. Herman (9,232 ft.) contrasts sharply with the Dead Sea, 1,300 feet below sea level (the lowest place on earth). The near impassibility of the desert regions lay in sharp contrast with the ports and harbors of the coastal regions. Palestine history of conflict dates to even before Abram's rescue of Lot. Ancient Palestine has seen blood throughout nearly every age of human existence, dating back to the earliest civilizations of the world. Palestine, or Canaan, or Israel, was described by God in Deuteronomy 8:7-9. "For the Lord your God is bringing you into a good land, a land of brooks of water, of fountains and springs, flowing forth in valleys and hills, a land of wheat and barley, of vines and fig trees and pomengranates, a land of olive oil and honey; a land where you shall eat food without scarcity, in which you shall not lack anything; a land whose stones are iron, and out of whose hills you can dig copper." 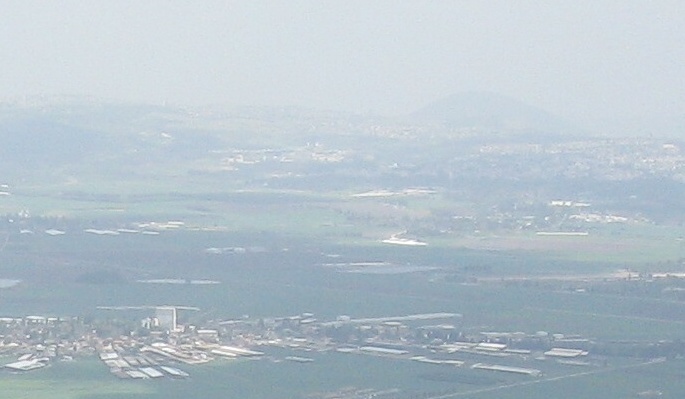 An aerial view of the Megiddo Valley, outside ancient Megiddo. This is the site of the End Times battle of Armageddon. It has seen bloodshed since before the Pharaohs of Egypt. Solomon built up and fortified the city during his reign as King of Israel - archaeological evidence of which remains today. 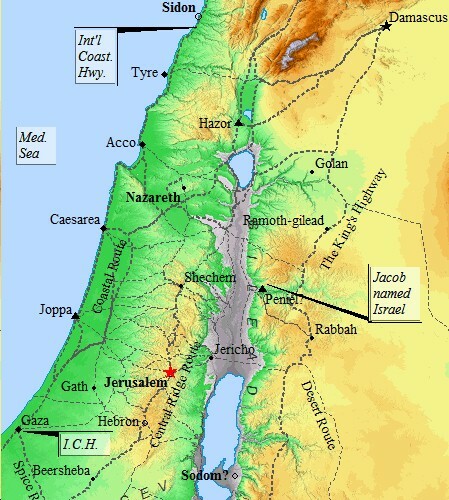 The land of Palestine, or Canaan, was occupied by Canaanites long before Abraham arrived. These people traded openly and freely with the major powers of their day. With Egypt to the south, Syria to the northeast, Phoenicia (Lebanon) to the northwest, and Sumer/Mesopotamia to the east, the Levant was dissected with trade routes and links to outside cultures. Strangely enough, though, there is very scant textual evidence of Palestine history and Canaanite culture. Unlike the Egyptian, Syrian, and Mesopotamian civilizations, where there are wealthy archives of material, Palestine history did not leave behind an archive of texts from contemporary Canaan of old. As a result, a reconstruction of the life and culture of an ancient Canaanite from this period in Palestine history is difficult to accurately depict. The earliest portions of Palestine history have been discovered through archaeological finds and excavations throughout the land. Canaanite pottery is especially helpful when dating specific areas and cities, to specific times throughout history. Egypt's presence was well established in the region, and Egyptian artifacts from multiple ages have been found in Palestine. An example of using pottery for dating would be, for instance; if a certain type of pottery found in Canaan was also found in Egypt, and if that type of pottery in Egypt dated to the reign of Seti I, then that would date the layer in Canaan as well. Palestine history is closely connected with Egyptian history. With the absence of textual data, other methods such as the one described above must be used to construct ancient Palestine. The Canaanites of ancient Palestine (8,000 - 7000 BC) spoke a Semitic tongue, the closest relative of which is Syriac and Hebrew. These people were often referred to as Ammonites, Moabites, Phoenicians, Hittites, Canaanites, Israelites, among other such Biblical names, and each achieved its own national identity. Yet, ethnically speaking, each nation was Canaanite. Thus, Palestine history is marked by a heterogeneous mix of people, each of their own cultural identity, yet ethnically the same. Palestine history predates even the Neolithic Age. The Natufian civilization flourished in Palestine during the Mesolithic Period near Jericho. A type of sanctuary was found near the spring of Ain es-Sultan, or ancient Jericho. This sanctuary belonged to the Natufian hunters of the region. It was undoubtedly due to the spring that the Natufians chose to settle down and establish permanent roots in this particular location. 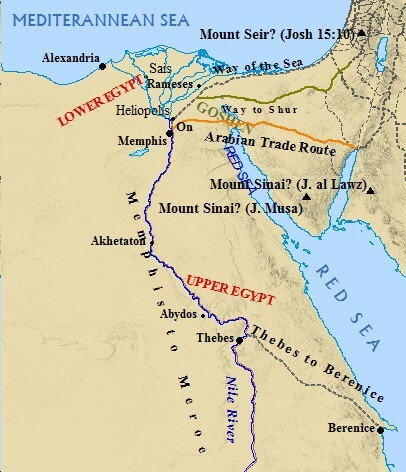 Thus, the site of Jericho is, perhaps, one of the first attempts at a civilization attempting to transition from a lifestyle of nomadic wandering, to a lifestyle of settlement, or sedentism. This occurred, according to some scholars, as early as the 10 millennium B.C.E. Plant and animal domestication sprung forth from this transition, and would highlight the 'Neolithic Revolution'. This process did not occur overnight, however. It may encompass a period of up to one thousand years within Palestine history. The dates of the Neolithic Age vary as starting anywhere from 9500 B.C. to 8300 B.C. It is widely agreed upon that this era breaks into subdivisions, mainly characteristic by subtle changes in pottery. Thus exact dates tend to vary, sometimes by hundreds of years, from scholar to scholar. However, it was during the Neolithic Age, that Palestine history began to show significant signs of development and sustained growth. Israel and Palestine history is closely tied to the land. At this point in its development, Canaan had advanced to an economy that was developing from a system of gathering food, to methods of producing food. Their chief source of meat was gazelle, either herded or hunted. Palestine history had not yet embraced animal domestication. Major breakthroughs occurred, however, in the area of plant domestication, specifically with barley and wheat. If these early inhabitants were, in fact, some of the earliest descendants of Noah and his offspring , then a tendency towards knowledge of plants would be natural. Enoch attributed early man's knowledge of plant domestication to the fallen angel Semjaza. The pre-flood world was based on the premise of agriculture. One of the first acts of Noah after the Genesis Flood was to plant a vineyard. This knowledge would have been passed down through the generations. Around 8500 B.C., an era termed by some scholars as the Pre-Pottery A Neolithic Age, most of the settlements and villages were small and possessed no walls, unlike the large metropolitan cities of Babylon and ancient Ur. The people lived in well built mud brick houses, circular or oval in shape. Jericho, however, had developed into a town of sizable stature, with massive defense walls, and at least one tower. Many scholars agree that around 7200 B.C., the culture of Palestine changed, due in part to a migration of people from the north. The settlement at Jericho may have contained up to two thousand people at this time of Palestine history. However, between 7000 and 6000 B.C., there is a gap in occupation. Some historians say this gap covers up to five hundred years. This gap may be a result of drier climatic conditions. A drier climate would have had a severe effect on Canaanite agriculture. Perhaps this led villagers to return to a lifestyle of herding and grazing in order to survive. Settlement did return to the area, however, towards the middle of the sixth millennium (6000 - 5000 BC). The settlements, though, were on a much smaller scale. In this period of Palestine history, Jericho was hardly the strongly fortified city of old. Rather, it, like most other sites of this era, was a small, simple, unwalled village. Towns and villages cropped up where there were ample supplies of water, food, defense, and transportation. Springs and small rivers were the usual suppliers of water. Later, the development of methods to transport water allowed settlement farther away from water sources. Palestine's economy of nomads and farmers took root in these formative years. Palestine and Israel shared this dimorphic type of society. Some people settled down, establishing villages,and permanent roots. Others wandered with herds of cattle, sheep, donkeys, and other animals. People looked for natural barriers of defense, allowing for easy fortification of towns and villages, before settling in a spot. Good farmland was also a necessity for sustained growth and development. Oftentimes, settlers looked for prime locations along trade routes. This gave easy access to goods and supplies not available in the nearby areas. Locations that met these conditions were often occupied for centuries, oftentimes rebuilt and resettled after a war, or a natural disaster. Others took to herding sheep, goats, and cattle. These people lived off the land, and wandered wherever the grazing was best. The contrast between established villages, and semi-nomadic herdsmen, would implant itself firmly into the consciousness of ancient Palestine. Over the centuries, mounds of debris from these cities formed flat-topped hills that archaeologists call "Tells". What is known of Palestine history has been gathered from Tells which abound throughout all of Canaan. The majority of Tells in ancient Palestine were less than 10 acres. 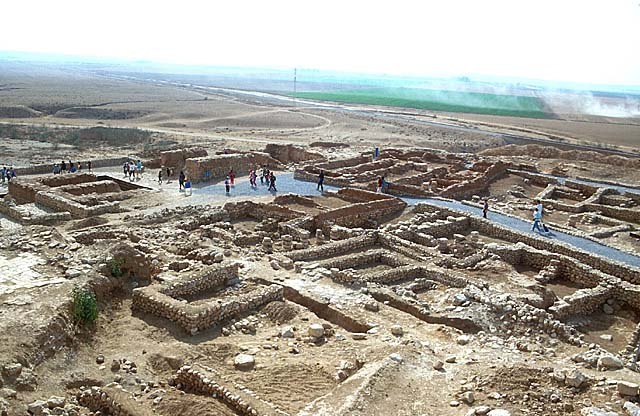 Ekron, a Philistine city, covered fifty acres, and was amongst the largest Tells in Palestine. The Canaanite city Hazor, including the Lower City, was 200 acres in size, and the largest Tell in Palestine. Megiddo, Hazor, and Jerusalem were also prominent cities. Share Your Thoughts On Canaan, or Palestine. Click on the link to share your thoughts, comments, and questions on the land, history, and people of Palestine! The "Copper Stone Age" brought more, and fairly larger, settlements throughout the Near East. These settlements, however, were not well fortified, suggesting that this point in Palestine history was relatively peaceful. 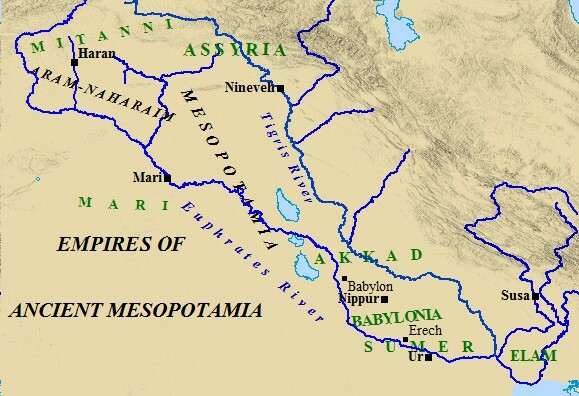 Mesopotamian sites from this period stand out above all others of the Chalcolithic Period in the Near East. In Northern Mesopotamia, cultures such as the Hassuna, Samarra, and Halafian, flourished artistically, evident by the sophisticated pottery found in the region. Starting around 4200 B.C., and extending to 3000 B.C., Southern Mesopotamia, along with China and Egypt, became the cultural leaders of the ancient world. The Bible makes mention of Uruk, biblical Erech (Gen. 10:10), as one of the founding cities of Nimrod's empire. Excavations in Uruk attest to the importance and wealth the Bible places on this city. Mud brick temples, with geometric shapes and different colored cones, have been discovered in the ancient city. The Sumerians exploded onto the scene around 3500 B.C. A tablet inscribed with pictographs was discovered in Kish, dating back to 3500 B.C. This is the world's oldest evidence of writing, and an alphabet of sorts. Large temples were erected throughout southern Mesopotamia, referred to as Shinar, in the Bible (Gen. 10:10, 11:2, 14:2). Many important and innovative ideas, and cultural advances developed in this region. Cultural advances were not limited to southern Mesopotamia alone. Palestine was producing objects from copper to be used in temples. Highly skilled craftsmanship work, most notably with ivory, was discovered in and around Beer-sheba. The people of this area lived in well constructed rectangular shaped houses. Ghassul, situated east of the Jordan River, on the northern end of the Dead Sea, covered 60 acres. It was a large, open settlement, consisting of rectangular shaped mud bricked homes, very similar to those at Beersheba. These homes showed excellent levels of architectural skill. Teleilat Ghassul also possessed temples with wall paintings of bizarre and fanciful creatures, eight-pointed stars, and masks used in special rituals. This structure has been identified as an altar used for cultic ceremonies. An extensive Copper industry was in full operation during the Chalcolithic Age of Palestine history. Many settlements and camps have produced evidence of metalworking and mining, specifically with copper and turquoise. In the Sinai and Negev, especially, sites have been found to be associated with mining and the production of copper. At the Chalcolithic site of Abu Matar, one of the Beersheba sites, sophisticated metalworking activities were marked by the remains of raw malachite, flint anvils for crushing, ovens, and other such tools and equipment. Throughout Palestine history the land has acted as a buffer between Mesopotamian powers and Egyptian powers. As time progressed, the road system advanced, and Palestine became a crossroads for these two regions.Consequently, many sites in the Early Bronze Age history of Palestine show production on an industrialized scale. BEERSHEBA HAS BEEN A MAJOR CITY IN THE NEGEV SINCE BEFORE ABRAHAM. ABRAHAM BUILT A WATER WELL IN BEERSHEBA. ONE HAS BEEN DISCOVERED AMONGST THE RUINS OF BEERSHEBA DATING TO THE TIME OF ABRAHAM. At Khirbet Kerak, a building believed to have served as a public granary was unearthed. This building contained massive walls, four storage compartments carved into the interior of the walls, a central courtyard, and a room containing several ovens. Excavations from the biblical Zarethan (Josh. 3:16; I Kngs 4:12, 7:46; II Chrncls 4:17) have produced what archaeologists are calling an olive oil production facility. A sunken room was found within this facility, which provided an area to cool liquids, such as wine and olive oil, for storage. These sites, along with many others, prove Palestine history underwent a cultural, economical, and urban advancement, unparalleled before in this ancient land's history. Thus, when God called Abram to leave his father's household, and called him unto Canaan, it was not an empty and backward land Abram arrived in. Rather, it was a land of heterogeneous people, with complex relations, and centuries of established occupation on some level. Ancient Palestine was already steeped in the cycle of conflict, decline, and revival. First published in 1901 by Lewis Bayles Paton, Ph. D., Professor of Old Testament Exegesis and Criticism in Hartford Theological Seminary, The Early History of Syria and Palestine was the first of its kind to have ever been written. 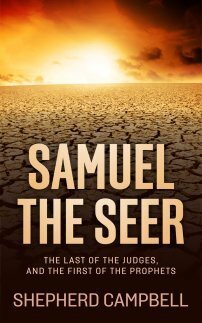 Barnesandnoble.com has brought back this classic that has withstood the test of time, and is guaranteed to enhance your understanding of the historical and social context of the ancient Near East! Click on the link below to re-direct to bn.com and The Early History of Syria and Palestine!